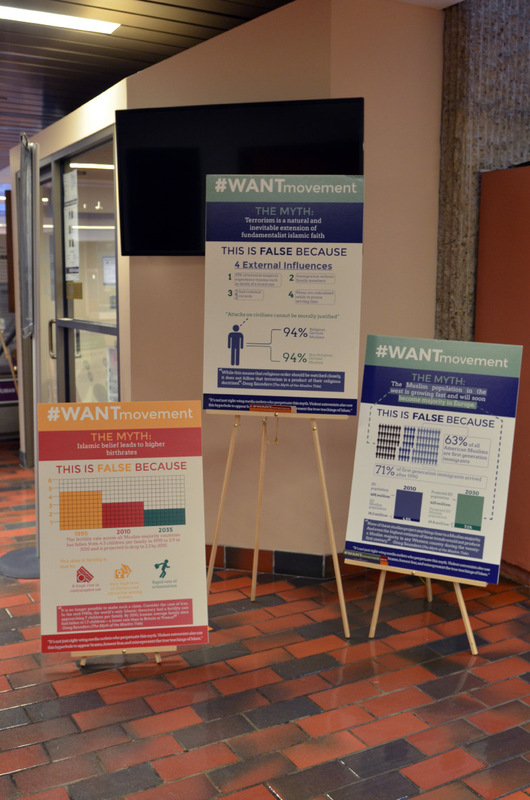 The W.A.N.T Movement features many useful teaching materials, like these infographic posters designed by students. From March 23 to 27, Mount Royal University students attempted to challenge the misinterpretations of Islam and Muslim identities. Using the acronym W.A.N.T. (We Are Not Them), students informed the student body that the extremism portrayed in western media and society doesn’t represent the true teachings of the Quran. Dubbed as “Want Week”, one of the initiatives main objectives was to clarify and raise awareness, through use of credible information, allowing consumers of news, media and popular culture the ability to critique and make informed decisions of the information they view. This event was inspired by the P2P: Challenging Extremism campaign put on by EdVenture and the Youth Education committee lead by the U.S. Department of State. There was a total of 20 university teams, with six international teams and 14 American universities all receiving a two thousand dollar budget to fund operations. While not anti-media, Grant-Johansen said he firmly believes that viewers need to verify their sources and come to an informed decision as to what Islam truly stands for. He said he also hopes that this campaign brings a sense of support for the Islamic community. Katy Conti, third year business and marketing major, said she feels that the terminology used in media outlets paints an inaccurate picture of Islam. She also noted the importance of the portrait project taking place in the library, utilizing photographs of various members of the Muslim community and allies around campus. Conti said she felt that W.A.N.T. highlights the importance of making the Islamic/Muslim voice heard in a positive light. “Find and follow, that’s the main thing. Find the truth,” she added. Winning campaigns and teams have prize incentives, with possible travel to Washington D.C., along with various scholarship opportunities. The winning teams will be announced late spring. Next story Come out, come out wherever you are!